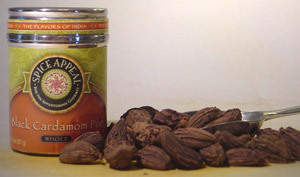 These smoky, camphorous, aromatic pods are commonly used in Indian curries, vindaloos, pilafs, biryanis, snacks and teas. Soak husks of the pods and throw on hot coals on the barbecue for a great smoking flavor. Due to their strong, pungent flavor, they are generally not added to sweet dishes.